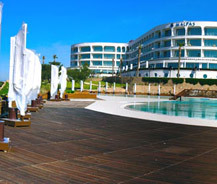 Malpas Hotel is situated in North Cyprus in the holistic part of Catalkoy village. It got its name from the medieval church in its area and it is situated between Mediterranean Sea and the Mountains so that you can view this beautiful scenery from the hotel. There are nearly 177 rooms in this hotel all built with balconies so that everyone can enjoy the beautiful view of Mediterranean Sea and the Mountains from its room itself. This facility is not available in all other hotels and also this hotel has a private beach which was built recently to guests of this hotel so that they can enjoy their privacy. This beach is just 3 minutes from the hotel and a free shuttle service to and from the beach is available for every hour. Also it includes one restaurant which offers delicious snacks and meals throughout the day. Sports such as beach volley ball and water sports are available in the beach interested people can play and enjoy. The rooms here are decorated and designed in a beautiful manner with modern technology to satisfy guests need. The rooms include all the features which are necessary to withhold the five star status of the hotel and the casino includes bars and restaurants with variety of drinks for the guests.